Pet insurers paid out a record £2m a day in claims in 2017, according to the latest data from the Association of British Insurers (ABI). That means £775m was paid out for pet insurance claims in total last year. The cost of an average pet insurance claim increased to £757 in 2017 from £750 in 2016. However, there has been a huge increase of over 150% from an average claim of £300 in June 2013. Despite pet insurers making record payouts, the ABI says the majority of pet owners do not insure their pets. It estimates that 67% of dogs and 84% of cats are and uninsured. According to a recent report from the PDSA, only 44% of pet owners have insurance. However, dog owners are nearly twice as likely to insure their pet than cat owners, according to the ABI. Find out about Bought By Many's unique pet insurance here. Is the cost of pet insurance increasing? The average cost of pet insurance has increased steadily over the last ten years. For instance, in 2008, the average pet insurance premium was roughly £208 according to data from the ABI; now, the average premium for dog insurance is around £324. It says the average insurance premium for cats is £171. Find out more information about the cost of pet insurance. The increase is due to a variety of factors. However, vet fees have been increasing, meaning insurers have to pay out more when a customer makes a claim (as you can see in the ABI's recent figures). This means that premiums increase to cover the payouts. However, Bought By Many has introduced a Fixed for Life policy that offers fixed premiums that will never increase, even if you claim. It is only available to pets under the age of two and it can be a good way to manage the cost of your insurance. It's worth bearing in mind that these prices are only average prices. Your pet insurance premium will depend on a variety of factors, including the breed of your pet, the cover you require, and where you live. Why has the cost of pet insurance claims been increasing? There are several factors that have contributed to the increase in the average pet insurance payout. One of the most important is the fact that vet fees are increasing. This is because the cost of treating a pet has been increasing overall in recent years due to advances in veterinary treatments. Pet owners are investing more in the health of their pets these days, according to the Society of Practicing Veterinary Surgeons, by paying for procedures like ultrasounds and MRIs. These have only started becoming common practice for vets in the last few years. Vets can do more for pets than ever before with better technology and more treatments available. While the cost of pet insurance is increasing, covering the cost of treatment can run into thousands of pounds if you don't have cover. Whether you need pet insurance or not is down to your personal circumstances. However, it can help pay for expensive vet fees that many people may not be able to afford. The cost of vet fees will depend on the injury or illness your pet is suffering from but some treatments can cost thousands of pounds. The ABI gives the example of an English springer spaniel that needed treatment because it swallowed a grass seed. It ended up costing its owners £3,400. Treating a cat with diabetes costs an average of £1,060. The ABI says the average cost of pet surgery is approximately £1,500. Most policies will only consider paying out for treatment if your pet becomes ill after you take out the policy. 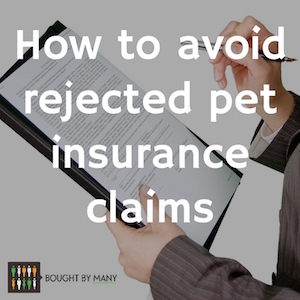 However, Bought By Many has launched a Pre-Existing Policy that can cover your pet for conditions your pet has experienced in the past. It does not cover conditions experienced in the three months before the start of a policy. Pet insurance can also include public liability. This can cover costs you are liable for if your dog injures someone or damages their property. For instance, if it ran out in front of a car and caused an accident. This insurance isn't necessary for cats, as the law does not hold the owner responsible if a cat harms someone. If you aren't interested in vet fees but are concerned about public liability, Bought By Many has launched a Liability Only product that covers you for £3 million of public liability insurance. Rebecca Hollingsworth, general insurance policy adviser at the ABI, sums up the benefits of pet insurance nicely: "Pet insurance gives you peace of mind that you won't have to deny your pet life-saving treatment because the veterinary bills are too expensive." If you're searching for pet insurance, have a look at Bought By Many's unique pet insurance products here. Stay one step ahead of the insurer and never have a claim refused.